and Big Steve's webpage here. When Wally Hope started a ramble to Stonehenge with the rainbow banner of 60's counter culture, I was 17, the social secretary of a Sussex college blasting out Lynard Skynard's Freebird across the common room floor. I got home one day to be startled by TV news of 'hippies' gathering for the summer solstice at Stonehenge. I was excited but oblivious to the profound effect it was to have on my life. I'd been to Windsor and other free festivals, and even helped carry a few scaffold poles and planks onto the stage and sat stoned through the Pink Fairies and Hawkwind sets. I remember giggling uder layers of clear plastic as the Hare Krishna band played through the night. It was an idealistic and wonderful feeling of Utopia - natural, raw, rough and ready yeah! But a catalyst for something fair and just in a deaf society that sees suppression, control and fear as the answer to the cry of freedom, peace and harmony. I went to Stonehenge for the first time in 1980 and felt uplifted about how together and hopeful the people were. I felt inspired to try and make it better. I met Nik Turner in the winter of that year in a squat behind Sadler's Wells theatre and he agreed to play at the Smokey Bears' "Smoke-In" at Hyde Park. We drove a psychedelic bus into the middle of Hyde Park, put up a stage, and held a mini festival with Black Slate, Androids of Mu, Here and Now, Inner City Unit, and speakers for the de-criminalisation of cannabis - an event that seems unimaginable now. It was a gas - but hair-raising what you had to do to draw attention to the injustice of our cannabis laws. I met Willy X and Polytantric - an off-shoot of the White Panthers - and designs were swiftly drawn out for the layout of the stage and pyramid roof. Nik Turner was a fantastic help and gave valuable experience in erecting the pyramid which had originally made its debut with Sphinx at the Edinburgh festival. Two months of numerous phone calls to bands and performers brought together a programme of five days and nights of contemporary music with Ruts DC, the Thompson Twins, The Damned, Misty in Roots, and Hawkwind. We dissolved back into the city and rejoined the nomadic drift from Stonehenge to Bristol to East Anglia and Wales from fayre to festival. At the beginning of the 80's travellers were relatively free of hassle. In '82 after an international Cultural Herb festival in Brockwell Park, Brixton, with Jah Shaka, Loxsone Outernational and DBC we went to Stonehenge and did it all again - a beautiful buzz. Stonehenge was growing rapidly: in 1980 12,000 people had attended, but by '82 there were 35,000. Co-ordination between English Heritage, the National Trust and ourselves seemed to be breaking down - because of the festival's expansion perhaps. Many of Stonehenge's problems could have and will be solved by closer co-ordination and planning by all parties. 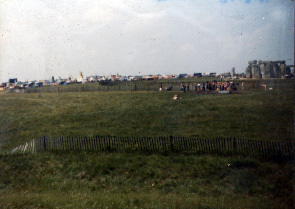 In '83 we decided to move the stage to the field closer to the woods and further away from the Stones. Sid Rawles and I wandered across the fields past the mounds clutching a dowsing rod; it twitched downwards and I opened my eyes to find myself in a circle of daisies - this had to be the place for the stage. In '83 the PA was boosted to 12K. PA wings were extended and the Black Pyramid light show organised visuals. As in previous years we ran things as cheaply as possible, all the bands played for free and we bucketed the audience and traders, as the groups played, to keep the jenny running. The six days and nights of music were amazing, with Doctor and the Medics, Hawkwind, Roy Harper, the Enid, Buster Bloodvessel, Dexy's Midnight Runners, Urban Warrior, Ted Chippington, Flux of Pink Indians, the Tibetan Ukrainian Mountain Troupe, Here and Now, and Benjamin Zephaniah, to name just a few. By '84 things were looking decidedly precarious. A group of travellers had squatted the Fargo Plantation in April, supposedly the National Trust's budget for that year's festival in the clear-up operation. The authorities were looking for scape-goats. Three weeks before the festival I was cycling to the East-West Centre when my wheel hit a gutter and I went flying over the handlebars. I wke up in hospital with concussion and a broken arm., I phoned friends to get the stage and PA together. I arrived on site with an arm in plaster. The Polytantric got the stage up at the 'Henge by the 16th of June. A video crew arrived to record the Enid, Roy Harper and Hawkwind at the Stones. Stonehenge '84 was very emotional. Something had changed. When the music was over I walked to the mutated spider skeleton of scaffold poles of the pyramid and picked up another can to put in the plastic bag to add to the heap of sacks. I turned to the stones one more time and took a breath. Another helicopter rattled overhead. "Anarcho United Mystics (AUM) started working back in 1977 because the 'revolutionaries' kept overlooking the need to change themselves as well well as the world, and the 'occult/religious' kept overlooking the need to change the world as well as themselves. These oversights reulted in 2000 years of failed revolutions and millions of people wasting their lives with religious/spiritual illusions and dogmas. After all, what is the motive of revolution? Ultimately, it is love. Love objects to the injustice of the present system, the starving millions, the wars and corruption of the ruling powers. But this love, the essence of revolution, is the easiest part to overlook and the forgetting of it has resulted in hundreds of failed revolutions and useless religions". Spontaneity is held by many to be the ideal form of social organisation. Given a highly aware group of people, spontaneity really works and can be a moving experience. The Free City of Camden, which became the base for early Stonehenge festivals was a loose, street-by-street network of squatters, revolutionaries and artists who subscribed to the philosophy of giving and practiced concensus politics rather than "representative democracy", establishing an anarchic lifestyle and a sense of community feeling. The first festivals at Stonehenge were the expression of this kind of community feeling. They were spontaneous "happenings" and quickly attracted other avante-garde groups and communes from around the country. The eviction of the Free City of Camden made tens of thousands of people homeless and many of them took to the road. The festival became the community's home, rather than its playground. Outside pressure, in the form of large scale destruction of the alternative society, and the official philosophy of greed, began to extract its toll on the festival. By the early 1980s the initial momentum of the early small gatherings began to attract a huge following. Whereas a few thousand people can communicate successfully enough to create and maintain a community, groups of fifty thousand or more require a proportionate number of activists to keep them together. The people who helped to put the festival together year after year began to take on specific roles and their numbers did not increase sufficiently to cope with the size of the festival. The existence of specialised groups, dealing with some aspect of the festival created its own dilemma: the widening gulf between them and other festival-goers. Biker groups who had initially helped out with staging were shunned by new stage crews. People who knew each other, such as the Tibetan Ukranian Mountain Troupe or the Tipi Circle, tended to stick together and confusion became the order of the day. This was exploited by petty mafias who began to sell hard drugs for profit and to intimidate those who objected. A newsletter was published in 1982, calling for the formation of a festival forum to avert the crisis and to organise the festival properly. It was circulated among festival groups and key people, with no response. Other literature was circulated, despite reprisals, calling for the expulsion of pushers and their henchmen from the festival. In 1983 people were finally stirred into taking some action by the proposed stage strike. Festival-goers took matters into their own hands and began to expel the few that were spoiling if it for the many. By 1984 there was an effective ban on hard drugs, but the damage had already been done, as public opinion, fanned by adverse publicity, turned against the festival. In retrospect, it is possible that the events of 1985 would not have happened if festival-goers had taken action swiftly when the problems first arose, a couple of years before. The five or so initial festivals produced, in later years, a complacent elite which lacked the love necessary to ensure the well-being of the festival as a whole, and could not cope with the problems that arose. After 1985 a festival forum finally emerged from gatherings in London and Glastonbury. A campaign for a new festival got under way and much needed communication was established on a year-round basis through meetings and activities around the country. In a way, the festival can be though of in two ways: an as an actual physical event, the gathering of people in one place at one time; and also as a spiritual event, in other words as a state of mind. It is easy to forget this dual nature of the festival and become over-involved in the practicalities. History shows the price of ignoring this other aspect. The spiritual side does not have to involve ritualistic mumbo-jumbo or far-fetched cultism - care, respect for others and the environment, and sharing, would guarantee a real celebration of life and a happy time for everyone. The walks to Stonehenge which have taken place since 1985 have already demonstrated that this desirable state of mind has returned. The unfortunate events of last summer when a tiny minority got involved in confrontation politics are a minor setback, which the authorities are trying to exploit to justify their untenable position. The evidence they ignore is three years of peaceful and good-natured activity by many people, mostly young, characterised by sharing, co-operation and a high level of awareness.